Hi, friends! I’m so excited to share that I just returned from a weekend trip to Dallas, Texas! This was my first time visiting the Lone Star State, and my mom and I definitely made the most of our 36 hours in the beautiful city. We stayed with family just outside Dallas and from there we made the drive to Waco for the day to visit Magnolia Market (from Fixer Upper’s Chip & Joanna Gaines!). I’ve grown up watching HGTV with my mom, and a huge part of my love of design and DIY is from her and those shows! Fixer Upper has been our recent favorite and visiting Magnolia Market was definitely at the top of my bucket list. It just so happened that my mom and I had two nearly free plane tickets to use before September, and what better city to cross off my list than Dallas?! 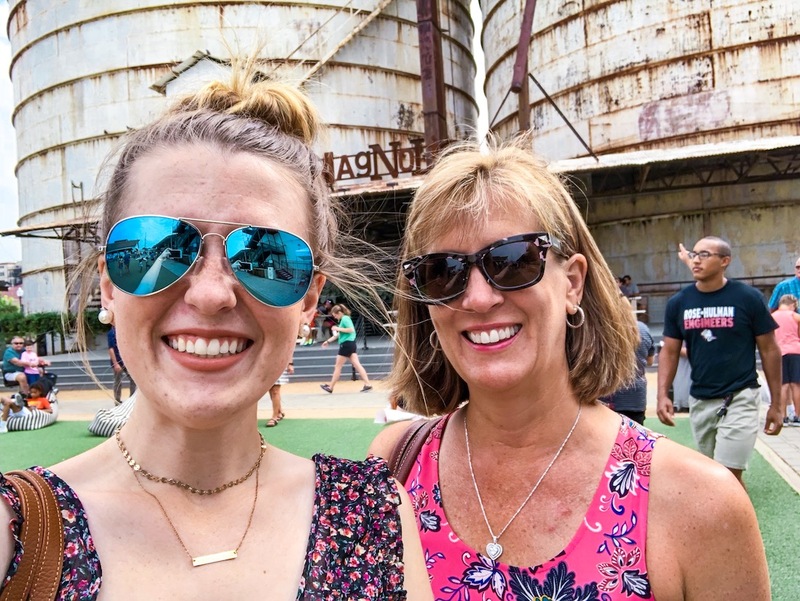 From visiting Magnolia Table, Magnolia Market & Silos, and the cute little city of Waco, I wanted to craft this post & video alongside my mama to bring you our best tips for making the most of your time in the city! We just had the day to do everything we wanted in Waco, but we agree that we made such great use of our time with these few tricks we learned for visiting Magnolia! Because of the hot hot Texas weather and the crowds of people coming to see Magnolia and ‘have a seat at the table’ at Chip & Jo’s new restaurant, Magnolia Table, our biggest tip is to arrive early! We had to drive about 90 minutes to Waco, and we arrived at the Table just before 9am. By then, there was already over an hour wait to be seated at the restaurant. There are many staff members around to greet you and keep you informed, and there was even a big tent with fans and a large outdoor seating and coffee bar area for those waiting for their table to be ready. One thing we were pleasantly surprised about was parking! There were plenty of parking lots available for Magnolia Table, and around the market, street parking is free! There’s also a free trolley and Magnolia golf carts that were driving around the market area to transport people from their cars or downtown Waco to the market. At the market, we easily found a parking spot about a block away on the street and then walked over to the Silos. We were there on a Saturday as well, which I’m sure is the busiest day! Plan ahead whether you want to eat in or take out. In addition to the main restaurant, there’s also a ‘Take Away’ market on one side of the building. Instead of waiting over an hour to eat, we chose to visit this area instead. Here, you can order coffee and pastries to-go and shop a smaller selection of home goods and décor (including their iconic t-shirts, like the one I’m wearing in the video!). We ordered our yummy, fresh-baked goods and enjoyed our coffees in the outdoor seating area. The Magnolia brand designs places to relax, enjoy, and spend time with the people you’re with. Even with our to-go food, we loved enjoying the atmosphere of the outside seating. That morning, it was about 86 and cloudy so the weather was even nice for sitting outside! We were so glad we didn’t wait in line for the restaurant! We didn’t care too much about actually sitting in and eating compared to just seeing the restaurant and enjoying our quick breakfast and coffee. Also, Chip & Jo’s cement handprints (as seen on the restaurant TV episode) are right next to the Take Away door, and you’d probably miss them if you didn’t enter there. Since we didn’t waste any time waiting (although we’d recommend eating in the restaurant if you do have the time), we headed to the Silos & market after we ate, so we could enjoy the market before the worst crowds and heat set in. We’re from Florida, so we’re well-accustomed to hot weather, but summer temperatures in Waco are around 100-105! We were lucky to visit on a cloudy morning and the heat wasn’t bad at all (although we did leave by 11am), but I’d definitely recommend comfortable clothing, sunglasses, and sunscreen! If you’re waiting for the bakery, restaurants, or food trucks, you could be standing outside in the heat so be prepared for that! If you like to shop (like we do), bring a large purse! In addition to arriving early and ordering Take Away, this is our next best tip! We both brought large tote bag purses for this trip so we could carry water bottles and extra things we purchased. My mom joked that I bought more things at Magnolia than I did during our whole trip to Europe, but I have no regrets! We each purchased shirts and some cute little kitchen towels, and I got a Magnolia coffee mug! There’s lots of things to buy, from home décor, to clothes and food, so bringing a larger bag is a great way to carry everything you need and be comfortable while walking around. After breakfast at Magnolia Table, we shopped and walked around the Market. It wasn’t quite time for lunch by the time we left, but there are lots of food trucks at the market which would be perfect for a meal. We didn’t want to leave without trying a Silos Bakery cupcake, though! So we split a cupcake and pink lemonade from the Bakery food truck (which had a much shorter line than the actual bakery) and they were so so yummy! Lunch is busiest time of the day for the market, so also plan accordingly if you’ll need extra time to wait in lines. In addition to the stores, bakery, and food trucks, there’s also a garden area and ‘Seed + Supply’ garden shop located at the back of the market. We love gardening stuff, so we loved this little stop! You might miss it if you didn’t walk all the way around, but the garden was also a beautiful picture spot. Is it worth the drive? Is it worth a whole trip? Absolutely!! Our family in Dallas was asking if it was worth the drive to spend the day there, and my dad (and non-Fixer-Upper-fans) may question if Magnolia is even worth the trip, but it is! We loved this trip and spending the day at Magnolia market. If you’re a Fixer Upper fan, we know you’ll love it! I hope these tips can help you have the best possible visit at Magnolia Table and Magnolia Market at the Silos! We had so much fun and I’m so glad we made the trip to visit Waco. After the Silos, we drove through downtown Waco to see what we could find. From a map we were given at the Silos (next to a guest book you can sign right behind the line for the bakery), we found the cutest shopping area called Spice Village. It was basically a huge warehouse full of 60+ boutique stores all jumbled together. We spent so long walking through the many stores in the Village and I honestly don’t even think we saw everything! This place was jam-packed full of darling clothes, accessories, and home décor, and my mom and I bought walked away with bags full! Texas clothes are so cute, y’all, I couldn’t miss out! Spice Village was located on the second floor on a large warehouse building, and the lower level had some other shops and restaurants. We ate lunch at a Tex-Mex place called Ninfa’s, and it was so busy, we figured it must be a well-loved Waco spot! The food was amazing there, too, and we’re so glad we decided to visit downtown Waco in addition to the famous Silos! My mom also recommends visiting Roots Boutique, located on its own on the first floor of the building. If you have more time, she also recommends doing the Waco day tour by Magnolia (they had trucks and info stands set up outside the market and restaurant). This two-hour-tour takes you around the city of Waco and to some of the houses designed by Chip & Jo! After spending two weeks on tours in Europe and with such a quick timeframe for this trip, we opted out of this tour, but it’d be a great addition to the day! Have you ever been to Magnolia Market? Do you love Fixer Upper as much as we do?! I’m so glad my mom and I got to share this weekend together, and I hope you get a chance to visit this lovely city!